In the past, our "NFC Hierarchy/Obituary" series was a weekly feature, and I'd typically write in excess of 2000 words on the teams around the rest of the NFC. I just don't have the time for that anymore with all my other beat reporter duties, so beginning last year, we published these a little more sporadically. This year, the plan will be to just do a Hierarchy post whenever we kill off a new team. This week, we have one new obituary. Heading into the season, the Bucs were a popular breakout team, because of their offensive skill position players. Notably, they were third-year quarterback Jameis Winston, stud wide receiver Mike Evans, free agent acquisition DeSean Jackson, first-round draft pick O.J. Howard, and tight end Cameron Brate. "OMG, how are defenses going to stop those guys," said many, probably. Well, easily, actually, when you have no running game, major holes on your O-line, and you don't play defense. 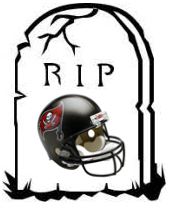 The Bucs are done. 11) Packers (4-3): The Packers are of course without Aaron Rodgers, but they have a chance to put some wins in the standings the next three weeks against mediocre teams like the Lions, Bears, and Ravens. Those next three games will tell if Green Bay can stay afloat juuuuust enough this season so they're not completely out of it if Rodgers is somehow able to return. 10) Redskins (3-4): Washington's offensive line is a disaster at the moment, as they finished their game against the Cowboys on Sunday with reserves playing at LT, LG, C, and RG. It's nearly impossible to win that way. 9) Lions (3-4): The Lions started 3-1, but have now lost three straight and are reeling. They can't run the ball or protect the quarterback. If you happened to catch their game Sunday night against the Steelers, you saw that their left tackle is Brian Mihalik, the dude the Eagles took in the seventh round as a defensive end in the 2015 NFL Draft. That would now be three defensive ends acquired by the Eagles during the Chip Kelly era – Mihalik, Alejandro Villanueva, and Taylor Hart – that were converted to offensive tackles by some other coaching staff. 8) Panthers (5-3): The Panthers have held three opponents to just three points this season. 7) Cowboys (4-3): I'll believe that Ezekiel Elliott is truly suspended when Alfred Morris is on the field and the TV cameras are showing a grumpy Jerry Jones in the owner's box with the Cowboys down by three touchdowns. Will the Eagles be 'very aggressive' at the trade deadline? 6) Falcons (4-3): Atlanta is just kind of... there. But they're dangerous, with legitimate star players and a good supporting cast. Despite not playing their best so far, they're still 4-3 and very much in the hunt. 5) Rams (5-2): The top three teams in point differential this season – the Eagles (+76), Rams (+74), and Jaguars (+73) – had a combined record of 14-34 in 2016. 4) Vikings (6-2): OK, maybe it's time to admit that Case Keenum has actually looked pretty good as the Vikings' quarterback with Sam Bradford's papier-mâché knees keeping him out of the lineup. And now the Vikes might replace Keenum with Teddy Bridgewater. 3) Saints (5-2): The Saints, like the Seahawks and Eagles ahead of them, went undefeated in October, and own the NFL's second-longest winning streak, at five games. Rookie RB Alvin Kamara is really freaking good, by the way. On the season, Kamara has 42 carries for 243 yards (5.8 YPC) and 2 TDs. In the passing game, he has 31 catches for 257 yards and 1 TD. 2) Seahawks (5-2): In last Sunday's shootout with the Houston Texans, observers ooh'd and ahh'd over Deshaun Watson, who threw for over 400 yards and 4 TDs (with 3 INTs). Meanwhile, Russell Wilson threw for over 450 yards and 4 TDs with just one pick. That was a bad day for a normally great Seahawks defense, and Seattle proved that it can win in a variety of ways, as it's done over the last half-decade. 1) Eagles (7-1): The Birds played perhaps their sloppiest game of the season on Sunday, and they still won by 23.